Store Van boasts more than 10 years’ experience in the creation of fittings for commercial vehicles and working vans. Besides design, our basic principles are the material quality and interior arrangement of fittings, ensuring a safe and orderly transport of your goods inside the cargo section. Spaces are optimised and the durability of fittings over time is guaranteed by their superior corrosion resistance. For each van equipment configuration, Store Van works out a realistic 3D project like this, which helps you to select the best mobile workshop solution for your needs. See the gallery with some examples of Store Van equipment solutions! 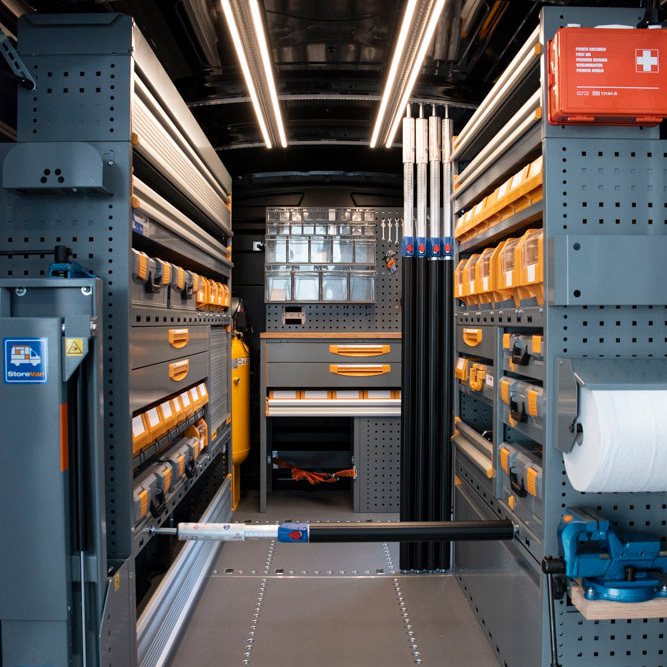 Store Van, a leader in the sector of fittings for working vans, offers you a wide range of storage modules, shelving units for vans, floor coverings for vans, small parts cases and dividers, but also products such as load ramps, roof racks, raised floors and many other accessories that can transform your working van in a real mobile workshop. No matter whether a Fiat or Ford: our tailor-made equipment will fit all types of vans, including second-hand vehicles. Our raw materials and advanced technologies are the fruit of continued investment in research and development, started with the design and production of industrial furnishing in steel, aluminium and plastic and always fostered by Fami S.r.l., our parent company. Store Van boasts state-of-the-art industrial plants and cutting-edge technologic applications, such as the cathod dip painting with acrilic resin that confers to our products unique characteristics, guarantees their high quality and optimises prices. Based on our professionalism and experience, every day we work out diversified solutions for any special working requirement, such as fittings for food vans, where the interior lining of bodyworks and safe load-anchoring systems are priority elements. Our crash tests prove our committment to safety. Their purpose is to make sure that your van equipment will not damage the vehicle’s cargo section in the event of an accident. All our modules are certified and traded both in Italy and worldwide. Contact us for more information. We will give you all details about our Store Van fittings.